Both baskets will be made from following this first steps. Following the diagram below, score your paper as shown. When you are done scoring your paper, you want to take the corner pieces, the ones with the diagonal score marks and fold all of them in. 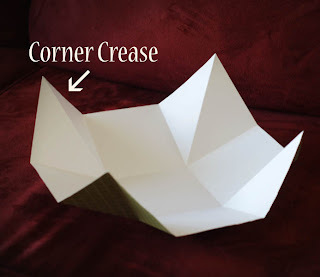 When they are folded, you'll have something that looks like the photo below with four corner creases. Take the corner folds and push them into the center. You'll need to poke holes in each fold and tie them together with twine or ribbon to hold the basket together. That's it. Cute right? 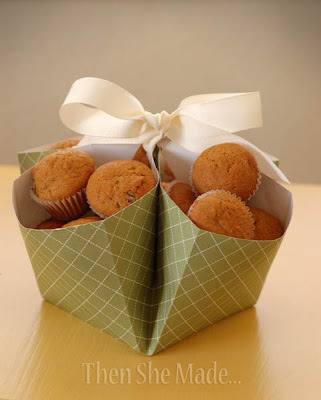 Here is my completed Judy basket filled with muffins and ready to deliver. Now to make the other basket, it's just as easy. Start by following those first steps of scoring and folding your paper. Then take each corner fold and instead of pushing it to the center, push it to it's left and tape down on the inside of the basket/box. 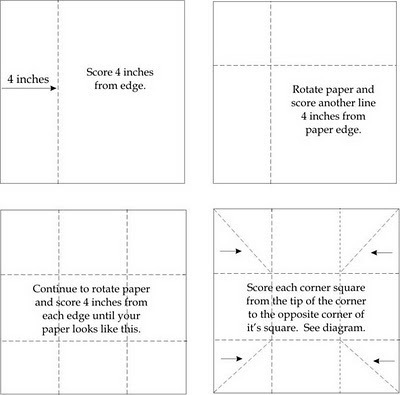 Repeat this process until each fold is taped down and you have the shape of a box that looks like the photo above. Punch a small hole on two of the sides and tie ribbon in place to make the handle. See, easy right?! Here's this one completed with treats. 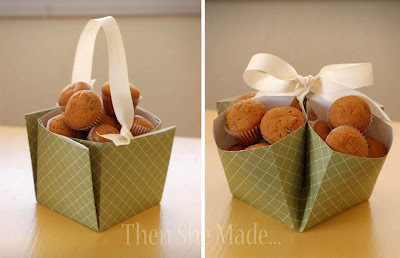 These little baskets can be used for so many different things and the expense is really low to create them. One sheet of paper and some ribbon. Most of us have those things on hand which means no more needing to run to the store to buy a container. These are so cute!!! I will definitely use these to make some mini muffins for my co-workers!! Thanks for the great ideas and patterns! oh these are perfect! I am throwing my daughter a bake shop party on Friday where the little girls get to bake stuff and then take it home and I didn't know yet how they were going to GET the stuff home - but here it is!!!! Thanks! Thanks for posting the 'how-to' too!! This is so cute - totally gives me ideas! Thanks! I saw these on Just Rhonda. Thanks for sharing. These baskets are fantastic! Thanks for sharing this great tutorial - I'm always looking for ways to combine my love of baking and scrapbooking! You are so artistic and clever. Even a simple paper was turned into a basket. 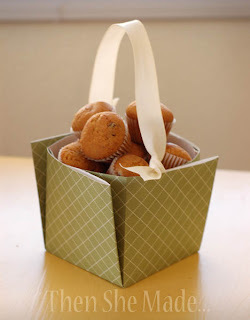 This is perfect to given away to your guests on your wedding day with edible cookies, chocolates or candies inside. I love this! so whipperberry knew i'd like your style. glad to follow. Please, let me know the size paper you used, thanks! This is such a cute and creative idea. I followed you over from Pinterest and would like to invite you to share this, and any other posts, on my link party at www.michellestastycreations.blogspot.com. Have a great weekend. MANY MANY THANKS ! I just made it ! so wonderful ! I love how you say "Please be kind" on your comment form - how could anyone be otherwise?!? I'm going to make the Judy Basket and maybe the other one out of cloth to put buns in to bring them to the table. I haven't figured out yet exactly how to attach them together. Maybe a few tacking stitches would work. These are really nice! Could make them using any color or pattern. I am thinking of a smaller version for Valentines or showers. Bridal showers or baby showers would be fun. Thanks for the idea. I just discovered your website and I absolutely love it! It's so fun to look through all of your cheap DIY projects. Please please post more! I'm always looking for cute ideas to make containers for things. Comes in handy quite often. Usually have some good paper handy due to being out where there's no paper store close unless we make trip to town, takes awhile. When I was making dog cards I learned to make a cute little gift bag to put them in when they sold. I had a pattern but was much too small so figured how to make bigger and more ideal for my uses. Made bags out of craft paper so they'd hold up. It was fun to decorate them in fun ways depending on season or holiday/time of year. Maybe I should just try selling the little bags and things like your basket. Is your basket only for our personal use? Thought should ask so I don't step on any rights. Let me know about selling the baskets ok?